Home / Otros países / Chile / “Vendimia” Vintage Festival in Chile, let´s go have some wine! We went down to the South of America to witness one of the most wonderful times for good wine lovers. And is that between March and April, the “Vendimia” is celebrated in Chile and in its main valleys. But what is a “Vendimia”? Vendimia stands for Vintage or grapes Harvest season. This is the time to harvest those great grapes, ready to be processed and turned into wine. That is why it is an occasion to celebrate the long-awaited harvest of the grapes. These celebrations called Harvest Festivals or “Fiestas de la Vendimia”, are held in all the main areas of wine production. Its local vineyards show the public its wines, exhibitions and food tastings, local dishes of the town, the entertaining grapes stomping competitions, shows and much more. Each village has its culinary and wine identity that is worth knowing. Each town even more curious than the other, and reminded me of the Villa de los Santos in Panamá, with the reigns of queens, as if we were in the Carnival. Why go to Chile between March and April? For those who want to live an even cooler experience, not only can you taste the wines in the vineyards, but you can also harvest the grapes directly from the vines with your own hands. The valleys of CasaBlanca, Isla de Maipo, Curicó, Colchagua, are just some of the many valleys that are to visit and that celebrate the Harvest in their main squares. Getting to the valleys takes at least and about an hour of driving from the center of Santiago. So, I suggest you plan to stay for a night in each valley to enjoy calmly what each vineyard has to offer, especially if you are going to drive. You can read more details of the Fiesta de la Vendimia de CasaBlanca HERE, and more about Fiesta de la Vendimia de Isla de Maipo HERE. Last Harvest Festival of the year, you’re still on time! This weekend, April 7 to 9th, the Buin Harvest Festival will be held at Cacique de Buin Stadium starting at 11am. The entrance will be free and the tasting ticket will cost 5mil CLP ($ 7.50USD) for the official glass + 3 tastings Reserva + 1 Gran Reserva, and 10mil CLP ($ 15 USD) for the official glass + 4 Gran Reserva tastings. 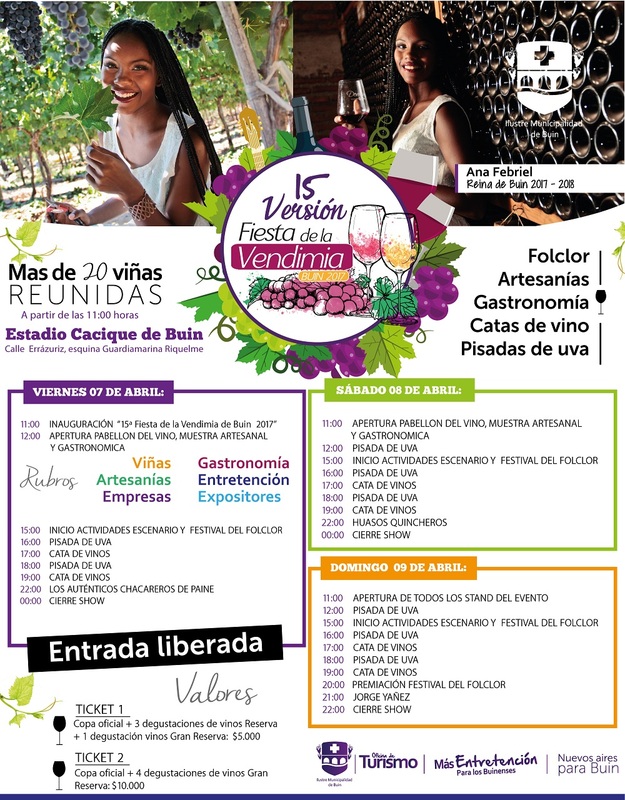 The Vintage Festival of Buin, will have traditional gastronomy, music, crafts, grape stomping contest, talks, tastings and of course, Lots of Wine! In this edition, there will be more than 20 vineyards participating such as Santa Rita, Concha y Toro, Carmen, Baron Philippe, Espaldares de Maipo, among others. They will have a roasting patio, where you can enjoy lamb on the stick and stone cooked meats, which will make a perfect pairing with your wines of choice. Buin is just 35km away from the city of Santiago. 1. You could take the Subway to Plaza Puente Alto and take a taxi. The Stadium is 30 minutes from Plaza Puente Alto. Take the subway to “Estación Central”. Then from the San Borja Bus Terminal in the Central Station in Santiago, behind the Mall Station, take the bus “Buin – Maipo” to get to Buin.